The Cleveland Cavaliers intend to try and convince LeBron James to stick around this summer, likely through making significant roster improvements he feels could help the team win now. Based on what we’re hearing leading up to tonight’s NBA Draft, I’m not exactly sure how they plan to do this. 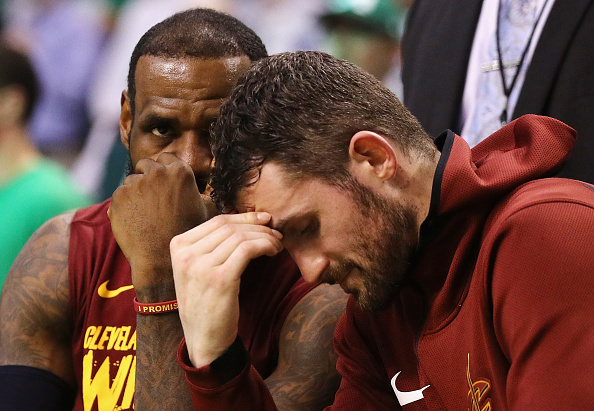 Apparently, the Cavs not only have every intention of keeping the player they select with the eighth overall pick tonight, they also reportedly have no interest in shopping forward Kevin Love. It’s difficult to see how this strategy helps their quest to improve the roster to James’ liking. If anything, it instead seems like Cleveland is stacking the odds against itself. Let’s get the obvious out of the way first – there’s no way the Cavs can significantly improve their roster via free agency. The team is miles over the salary cap, and will once again only be able to offer vet minimum contracts this summer. As a result, the only way Cleveland can do anything of value is through the trade market. Knowing this, it’s a bit odd the team has no interest in parting with its most valuable assets. Love is Cleveland’s only other All-Star outside of James. The talent drop-off between him and the next best Cavalier is significant. Very few of the remaining players on the team will generate more appeal in the trade market, either due to bloated contracts (Tristan Thompson, J.R. Smith) or underwhelming playoff performance (Jordan Clarkson, Smith again). You could argue Larry Nance Jr. would garner some interest, but he, too, appears to be in the Cavs’ future plans. As you can see, Cleveland’s chances of landing significant talent are hampered when it removes its best asset from the table. Equally harmful to the team’s hopes is insisting the player it selects tonight is also unavailable. Despite this being a deep rookie class, the odds of finding an instant superstar with the eighth overall pick aren’t favorable. It’s much more likely the Cavs land a player who they’ll need to develop over the next couple years. Right off the bat, you have to believe waiting for said player to adapt probably doesn’t sound appealing to James. He wants to see Cleveland assemble a roster which can compete for a championship next year. Keeping a player who may take a while to adapt to the NBA seems like the opposite of that. If the Cavs expect to shake up their roster enough to improve their odds to win a title next year, it’s going to require parting with either their eighth pick, Love or both. There’s little they could do via trade when claiming either asset is untouchable. They can certainly still swing some deals, but the returns surely won’t be big enough to make them championship favorites. With that said, you have to wonder what Cleveland’s plan is here. Unless GM Koby Altman has some tricks up his sleeve, it appears he and the front office are already handicapping their chances of convincing James staying put is his best option. Unfortunately, the Cavs’ apparent intention to keep both Love and the player they select tonight seems to hint they might be relegating themselves to the belief they can’t convince James to stay. Various reports, especially from Jason Lloyd of The Athletic, imply the team has been prepping for his departure for the past couple years. Some believe the front office is just going to go about its business this summer as opposed to swinging for the fences in hopes of keeping James. To be honest, hanging on to both Love and tonight’s new addition would just further convince me this is their plan. It should be noted there’s a ton of smoke out there as we approach the draft. For all we know, things may change tonight. We may find out Cleveland is indeed willing to do whatever it takes to ensure James sticks around, that everything we heard yesterday was false. If it’s not, I’m dying to see how the Cavs plan on convincing James to stay despite not parting with the only assets which could help them improve the roster. Or if that’s even the plan at all.